The abstracts and scientific papers will be published in an abstract CD. The abstract CD will be available on site at the booth of Pfizer Pharma (12.10) in return for the voucher, which is part of the congress documents. Scientific contributions that have been accepted for presentation for sessions of the DOG should also be produced in a publishable format and be ready for submission and peer-review before the meeting, during the meeting or by 31.10.2005 at the latest. Graefes Archive for Clinical and Experimental Ophthalmology should be submitted online only. Copyright for lectures, oral presentations and short oral presentations to be made at the SOE & DOG Congress 2005 belong to the societies (SOE and DOG). 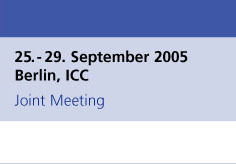 For this reason authors of oral presentations and short oral presentations are obliged to submit their contributions for review and publication by one of the following journals: Der Ophthalmologe, Klinische Monatsblätter für Augenheilkunde or Graefes Archive for Clinical and Experimental Ophthalmology. Contributions accepted for publication by one of the above journals may not be submitted for publication elsewhere. All Authors are kindly asked to observe the Instruction for Authors of the respective journals. The instructions of each journal can also be obtained from the DOGs Office on: Telefon +49 (0)89 5160 3062. Manuscripts not accepted for publication after the review process will be returned to the respective author with the reviewers evaluation.